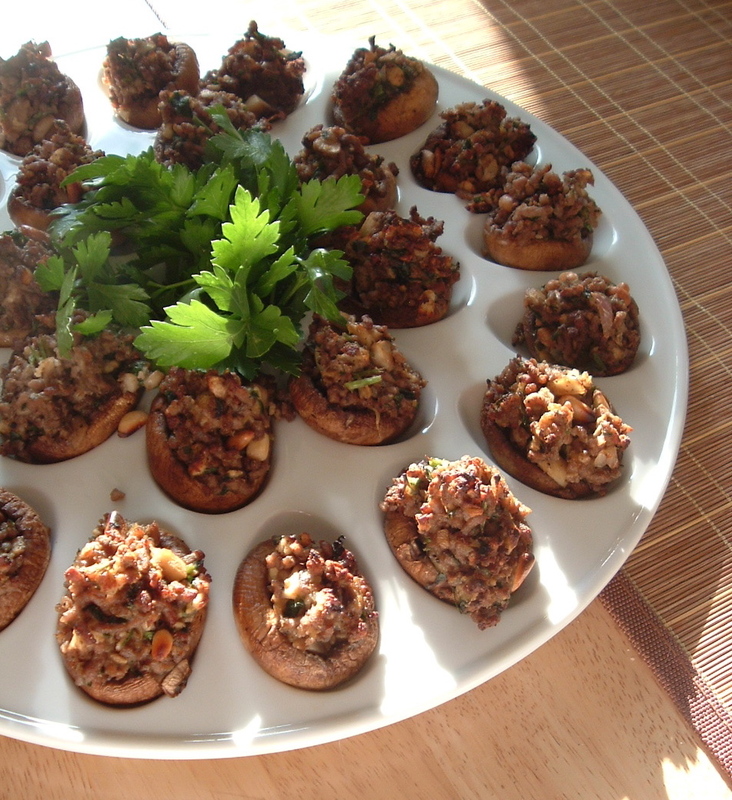 I don’t much care for stuffed mushrooms, since they always seem too bland and soggy. There are a couple of exceptions. One is grilled spicy tuna-stuffed mushrooms that they make at certain sushi/teppanyaki restaurants. 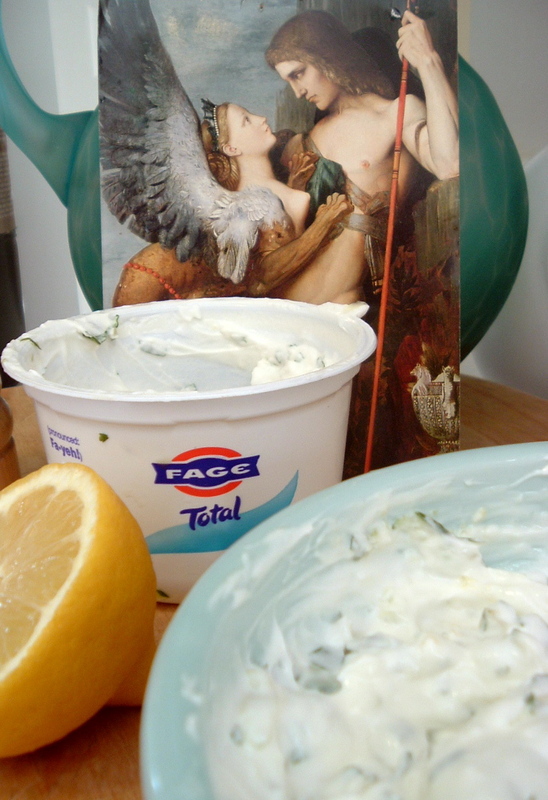 The other is this recipe, which I invented because I like me some gyros. If you like you some gyros, too, try these stuffed mushrooms: they are filled with herbed lamb and pine nuts, then topped with creamy cucumber-garlic dollops. They also kinda look like little footballs, so you can serve them for the game with your vegetable tray. Martha Stewart’s book on appetizers provided the technique for pre-cooking the mushroom vessels. Removing as much liquid as possible is crucial, and this method makes for dripless mushrooms. Tear pita bread into pieces and soak in a small bowl with milk to cover. For Dollops of Tzatziki: grate cucumber using a box grater. Squeeze out as much liquid as possible, place in small bowl, then salt with about 1/2 t. salt and let sit to remove more water. After 15 minutes or so, squeeze again and blot with paper towels. Mix together salted cucumber bits, yogurt, a few tablespoons of chopped mint, and a large clove of garlic, pressed in a press. Refrigerate until immediately prior to serving. Scoop out stems from mushrooms with a small spoon make pretty vessels. Chop mushroom stems and set aside in bowl. Rub baking sheet and mushrooms with olive oil (you could use a brush, but I just use my hands). Bake, cap-side up, for 7-10 minutes. (But I messed up and did cap-side down, to no great harm). Mushrooms will turn golden and will exude liquid when they are ready. While you are baking the mushroom caps, brown ground lamb in olive oil on medium high heat. Add chopped mushroom stems, 4-5 cloves chopped garlic and a couple of chopped shallots after cooking meat for a few minutes. When nice and brown, remove from heat and add salt and pepper. In a large food processor, pulse the soaked bread and the meat mixture to combine. Don’t turn it into a paste; you just want it smushed together so it will hold. Return to saute pan and add a handful of chopped parsley, a few tablespoons of chopped oregano, lemon juice, and pine nuts. Remove mushrooms from baking sheet, drain and blot dry as much as possible with paper towels. Return to baking sheet for stuffing. Stuff mushroom caps and broil close to the heat source for a few minutes, or until browned and crusty on top. Watch carefully, since they can burn easily. Serve on a white platter with dollops of tzatziki sauce on top. These hold well, since you’ve been diligent about liquid removal, so it’s ok to let them sit, but add chilled tzatziki only immediately prior to serving. If you’re fancy, garnish each mushroom with an oregano leaf. I’d imagine this would also be good stuffed in tomatoes or peppers. The Eugene Register-Guard, like all American newspapers, is featuring recipes for the goddamn football game in its food section this week. I know, I know, I shouldn’t modify football with ‘goddamn’ and still call myself an American, but I’m not a football fan, and assert my American freedom in saying I am not. In the interest of full disclosure, I am interested in the, um, outfits of football players, and the way they, um, run on the field, but that’s about it. But until then, I’d like to complain about the recipes in my local rag: honestly, Eugene Register-Guard, a recipe for how to make a veggie tray? Do you really think we’re that idiotic? 1. To establish a cogent & collaborative community of bartenders within the state of Oregon. 2. With this community, to increase the overall knowledge of beer, wine, spirits & cocktail production for the betterment of our craft. 3. To promote awareness of the craft within the public community, through both a developed relationship with the media & an educational platform to the general populace. 4. To secure a congenial relationship with OLCC, its agents & liquor companies to advance the procurement of more specialized & artisanal spirits in their portfolios. 5. To promote a wider, i.e., national & international, recognition of Oregon’s premier mixology. I am especially interested in #4, because Jesus, some better tasting hooch is not going to kill us, since, as I know from the OLCC certification course, that one beer equals one wine equals one drink, and therefore we should have access to all the likker available. Plus, I’m almost out of Qi Black liqueur, dammit, and it’s too snowy to drive to California for a BevMo run. So I wish them the best, and cheers! * But as a cantankerous English teacher, I must question the placement of the apostrophe. Does anyone share my budding fascination with French 75s? This is a champagne cocktail named after a WWI French machine gun. I work on modern literature, so I felt it crucial to sample this libation. Some particularly hip friends served it to me recently, and I immediately felt my coolness increase by 7.5%. Then I was gunned down in a few seconds flat. Take my advice: drinking a French 75 will help with all your problems. Here’s how to make one, via video by Robert Hess, on whom I may just have a slight crush. Champagne. Gin. Lemony goodness. Simple syrup. Heaven. Shake the gin and lemon juice with ice, then strain into a champagne flute. Top with champagne, and garnish with lemon twist. Note: straining is important: you don’t want lemon bits in your teeth when you’re kissing that special someone. If you’re tempted to use meyer lemon, don’t. The eureka lemon’s acidity is important for this drink. You may want to play around with the proportions of the simple syrup (I make this with a formula of 2 sugar: 1 water, then heat, stirring, until sugar melts; refrigerate). DO NOT use a Collins glass. That gives away the secret that you will be “hit with remarkable precision.” Think Mata Hari. Think fast. You can thank me from the floor. It’s snowing in Eugene, and the Californian in me shoved aside the Midwesterner and ran outside to take pictures. We only get snow like this once every couple of years here, and it makes me happy because I remember the sound and the smell of snow, so hopeful, so vivid. And being chilly, I made chili. 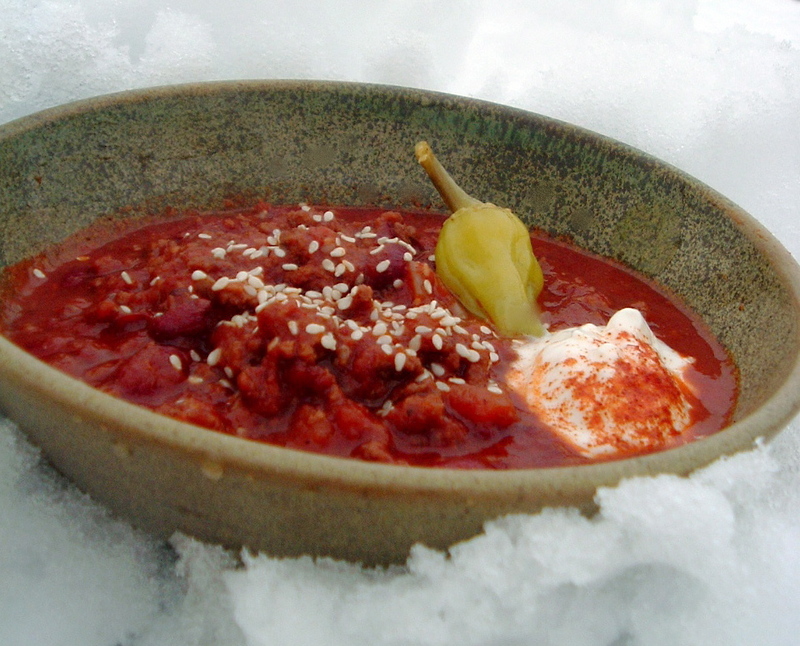 This is one of my favorite recipes, and the best Midwest-style chili I’ve ever had. It’s particularly lovely because you can make it with almost all pantry ingredients, so it’s perfect for a day you’re snowbound. You can make it on the stove or in a slow-cooker. The recipe is a significant modification of one in a cookbook put out by the graduate students in my first grad school. It was called “Peanut’s Plebian Chili,” after a dog named Peanut. I ditched the Peanut, for obvious reasons, and made my own class-based value judgments. And I welcome you to do the same. Brown (A) on high heat in a dutch oven, preferably in two batches, but I’m not lookin’. Drain meat of extra grease. Turn down heat to medium low and add (B) to coat meat. Stir in (C), then cook for about 1 hour, covered, at a simmer. Tastes better the next day. Add salt only if necessary. Usually doesn’t need it, but if you use low-salt kidney beans or use less processed substitutes for the steak sauce and catsup (which I don’t recommend in this recipe), you’ll need salt. Serve with a dollop of sour cream, if that strikes your fancy, and/or pickled peppers. I prefer straight-up saltines and a beer chaser. what’s black and white and read in eugene? On January 1, we started receiving the local paper. This marked the first time I’ve regularly read a local paper in over 15 years. It’s partly a fluke — the New York Times delivery person refused to deliver the paper to my porch, which meant that more often than not I’d have to get dressed, go outside in the cold rain BEFORE my coffee, and retrieve the wet, besmirched paper from the muddy grass or behind my car. After repeated calls, I gave up and just stopped reading the paper in the morning. The Eugene Register-Guard is no New York Times. I feel my IQ dropping each time I read it. Still, it has its charm. I’ve had limited knowledge of local politics for years, since I don’t watch much TV and only occasionally pick up the alternative weekly. Eugene is such a small town, with small-town insular attitudes and chatter, that we really lose an ability to communicate with our neighbors and friends when we don’t have access to news in the vernacular. All in all, it seems like Eugene is often a chicken running around without a head. To a newbie, the yuppie v. hippie battles are very amusing, the slapstick routines of local government less so. There’s some ridiculous, everchanging plan about a new hospital, and another about wasting a few mill on a new stadium. Meth addicts are stealing copper wire from power stations, so The Man made a plan to start painting wire in identifiable colors. The newspaper editors removed a comic about a black family after segregating it to the classifieds page. Someone’s up at arms about the design for the new pizzeria, complaining that the modern-style architecture (excuse me, “Northwest contemporary with an urban buzz and shadows of ancient Italy”) will fit into the neighborhood less well than its current design (Gay 90s green, red, and white Farrell’s ice cream parlour with encrustations of light bulbs ). A charter has been taken away from a free-for-all alternative school thanks to assessments like No Child Left Behind. No laggards here in Eugene, that’s for sure! 1 – 12 oz. package chocolate chips. [Preheat oven to 350 degrees.] Combine the butter, sugars and eggs. Beat well. [Add the eggs after creaming the butter and sugar and vanilla, and ignore “add vanilla” later.] Add the dry ingredients, beat well. Add the vanilla, nuts and chocolate chips. [And mix with wooden spoon to combine. 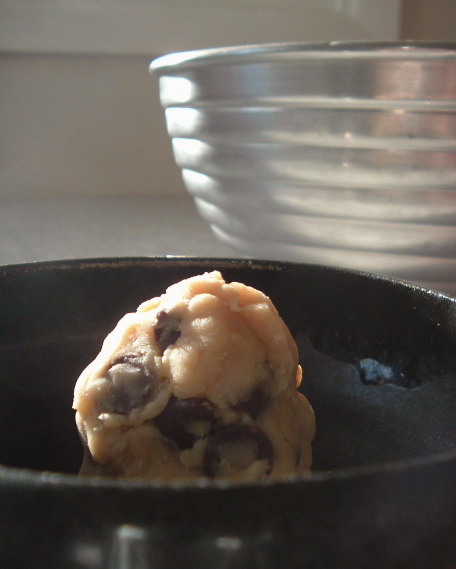 Drop dough in tablespoon-sized portions on a cookie sheet lined with foil.] Bake at 350 degrees for 10-12 minutes. Enjoy! The family obviously loved grandma, and I like the idea of the recipe addition to the obituary very much. I’m pretty sure, though, without checking, that this is a variation of your standard Toll House cookie recipe, which makes the recipe addition even more fascinating. To be remembered most of all for your standard recipe that has been printed on the back of chocolate chip packages for decades? Awful? Or is it the same quest for — and certain achievement of — immortality that grips artists and writers? I can say this: I made the cookies, in memoriam. They are honestly an old-fashioned cookie: a bit cakey and rather plain. I served them to my husband, who said they weren’t anything like my regular chocolate chip cookies. Indeed, quoth he, they reminded him of his (dead) grandma’s cookies. And that’s why I like reading the local newspaper. If you’ve never had Korean barbecue, you should feel cheated. I desperately miss the grill we used to frequent in Oakland, California, a big restaurant with high powered fans over each table and waitresses who would hurry to the tables with pans full of real, honest-to-goodness wood charcoal, weaving through the aisles and dodging customers in what surely must violate all kinds of codes. 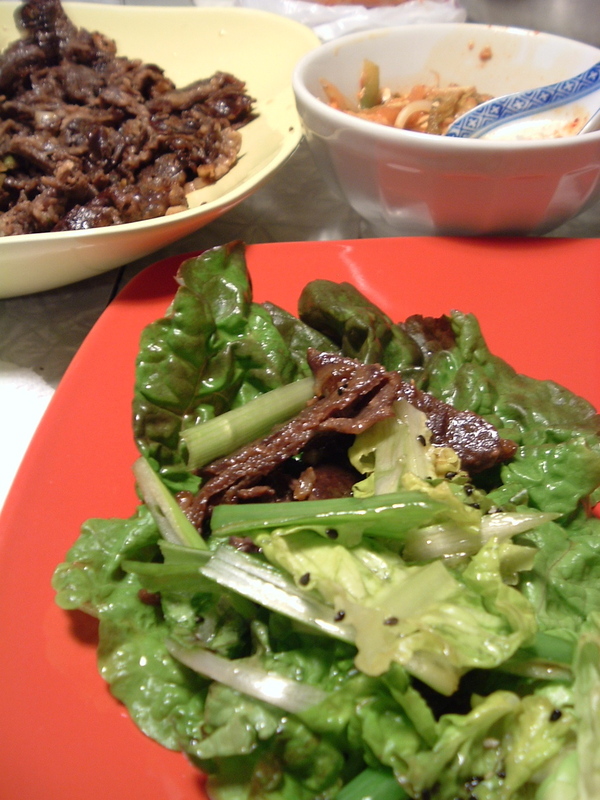 Folks would grill pieces of marinated, succulent, thin-sliced sirloin, then wrap it in lettuce leaves with a dab of miso, a jalapeno or garlic slice for the brave, and sesame-scallion salad. In Korean, it’s called bulgogi. In America, it’s called dee-licious.All is not lost, though. If you have relocated from the Bay Area, you’re tired of the slow cooker, or you just plain want some barbecue meat in the middle of winter, I have the perfect recipe for you. Serves: 2 with no abandon, or 4 more reserved people, with rice and a side dish or soup. Combine all ingredients in A. to marinate meat for 2-12 hours. To cook steak, either grill on high heat (sugars will carmelize and it will cook very quickly), or place in one layer in a roasting pan with marinade and broil on high for 5-10 minutes (again, keep an eye on it, as it will burn easily). When meat is browned and tasty-looking, remove to cutting board, chop into bite-sized pieces, and place on serving platter. For the wraps, chop the bottom ribs off the biggest leaves of romaine, and set aside tops of leaves in pretty pile to serve. Chop the ribs finely. Place in a bowl, then add scallion ribbons and the inner leaves of the romaine, chopped. Mix sesame oil, soy sauce, and sesame seeds in small bowl for dressing. Toss salad with dressing at the last minute. DO NOT ADD DRESSING UNTIL IMMEDIATELY PRIOR TO SERVING, since it will make the lettuce limp rather quickly. To assemble wraps, place a few pieces of meat and some of the dressed salad on a lettuce leaf. For a more authentic version, add a dab of miso or Korean bean paste, which is darker and more rustic than the standard Japanese white miso but tastes similar, a slice of raw garlic, and/or a slice of jalapeno. Koreans don’t generally add kimchi to their wraps, but I’ve seen some Americans doing that and they seemed happy, so go for it if that appeals to you.